Happy Thursday everyone, I hope you feel better than the Nasdaq this morning. The index is off nearly half a percent, putting it down 50 points from the 5,000 threshold. Please sound the alarms, and circle the wagons. Today we’re taking a brief look at the chatter surrounding the app space, especially as it relates to Apple’s App Store, and the value of a certain company compared to a specific fundraising total. No wave lasts forever. And, that we are seeing chatter concerning cracks in the various app ecosystems precisely as sales growth of smartphones slips, and Apple struggles to grow sales of its own iconic handsets makes the timing hardly surprising. However, there are changes on the way that might make the situation more palatable for developers. Apple, for example, is changing its store practices, allowing “developers [to] advertise their wares in search results and [will] give developers a bigger cut of revenues on subscription apps.” That sounds quite developer friendly, but according to Glenn Fleishman on Macworld, it isn’t clear how developers will respond to the changes, and there is still some confusion concerning Apple’s new policies. Presumably those questions will be answered in coming weeks. And that’s a poll of the nerds. It could be that the smartphone revolution has squeezed much of the app juice from whatever fruit was within low reach. Does that mean there won’t be new breakout apps? 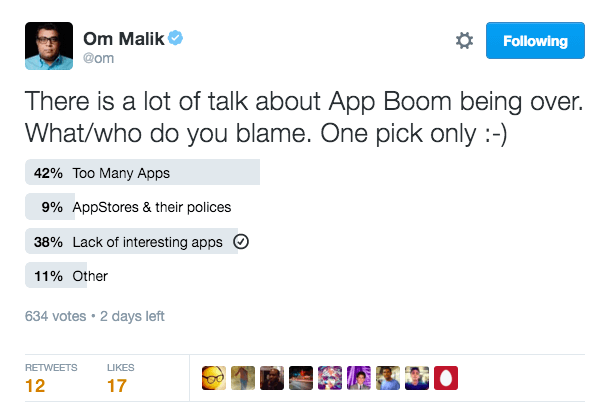 Of course not, but it does imply that the pace of innovation in terms of new app category creation may be slowing. On your smartphone, that is. Let’s hope VR and AR get here in a hurry. Twitter is worth in the neighborhood of $10 billion. $10.25 billion as of the time of writing, to be precise. That number pales when compared to the number of dollars that Uber has raised. Mattermark pegs Uber’s total raise at $14 billion. DataFox puts it at $14.9 billion, while Crunchbase reports a more modest $12.5 billion figure. What matters is that each source indicates that private investors are that much more interested in Uber than public investors are in Twitter. We’re comparing oranges to cement mixers by this point in time, but anything we can do to keep scale in perspective is usually a worthy exercise. Have another: Uber recently raised $3.5 billion in a single shot. Twitter’s aggregate cash account is $3.6 billion. Subtract each companies’ cash from their respective valuation and the comparison between how much investors value Uber’s growth compared to Twitter’s over the next few years is even more stark. PSA: Do You Part! Tweet Today! You need a shot of espresso and a LaCroix that is anything but that terrible lime flavor. Get going.